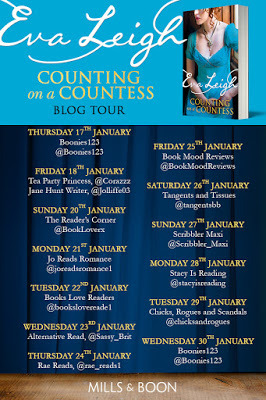 Hi welcome to my blog, I'm the last one on this blog tour, I would like to thank Eva Leigh for her books and Mills and Boon, and #MillsandBoonInsiders for asking me to join the blog tour. I enjoyed this book more than the previous one, and the main reason for that was the heroine Tamsyn oh my what a feisty and strong character she is. For me I didn't really connect with Kit and it was only in the last 20% of the book that I finally understood Kit. Overall this is a highly entertaining book, that takes you from Cornwall to London. If your a fan of Poldark like I am then you will enjoy reading. You can buy this book from Amazon UK and all other retailers.